Stephen von Spiegelhauer, also known as the White Wizard, gives us fellow kids entertainers a treat today: a simple, creative tool that will add loads of fun to your gigs and market your services so effortlessly all at the same time. Read Stephen’s post below to find out how to do this insanely effective promotional material yourself. Like most of us, I have tried using social media to promote my business in the hopes of getting my product in front of more people and thus generate more income. However most of the time, I’m the one putting in the time, posting pictures, tagging people, and even asking parents to tag me in the pictures they post. At times I wondered why I kept doing this for the few measly likes I get—likes I get mainly from people I know. How do I reach new customers?, I wondered. I was listening to a podcast by Zivi Raviv on raising your fees when Zivi began speaking about making parents our champions. While listening to this, I was also browsing images for wedding magic and I came across Instagram and Facebook frames used in wedding receptions and birthdays. I asked a friend to make several promotional materials on Photoshop. Before we came up with the final product, we spoke about some characteristics of the design. These I share below. When making your own Instagram frame, remember that you will have to transport it to different venues. You therefore have to consider the size of your vehicle when choosing the size of your frame. My vehicle is large enough to transport a large frame so I made it to measure 1040mm x 1450mm / 41 x57 inches. You may choose to do that or opt for a few smaller ones made in different themes (Christmas, Easter, and Halloween, for example). The thickness of the foam I used measures 1 cm / .5 inch. The cheapest option is a material here in Australia called corflute. I would not recommend this however as corflute is very thin and can be easily bent and permanently creased. I opted to go with thick foam that has card on both front and back because it’s thicker and more durable. I also had the print on the foam laminated so as to protect it. Here are the three designs we came up with for my Instagram frame. Design 1. I was concerned that there were too many thin parts that could be bent or broken. The parrot’s feathers on its wings and head could easily break and the wizard’s head might bend forward. Design 2. We tried to cover parts of the parrot by adding balloons to the bottom of the frame. However, I still felt the head was vulnerable to breaking or bending. Design 3. Adding more balloons seemed to do the trick. I was happy with how the characters are now protected. #Hashtags. The sky’s the limit here. I suggest typing in many different hashtags on Instagram to see which ones are already being used and are popular in your business circle (for example, #kidsmagic). You can also include hashtags to express a little of your own personality. For instance, I came up with #doesmyparrotlookbiginthis in my Instagram frame just to add a dash of humor. Play around and see what you can come up with. If you’re still not convinced, let me tell you what happened when I used the frames in actual events. 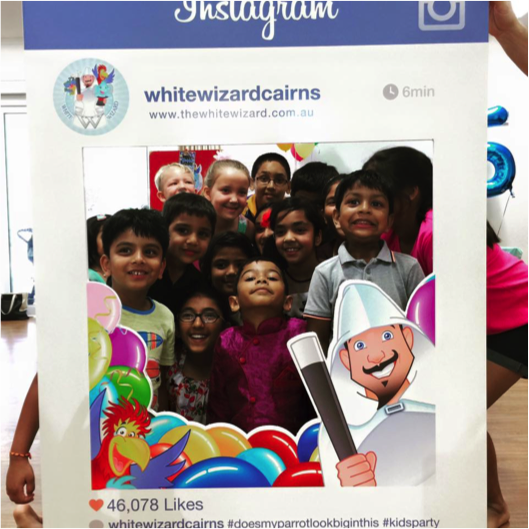 I road-tested the Instagram frame at two birthday parties for 5-year-old boys. The first was a small gathering in a stylish home, and the second was a large party at a hall. At the end of both shows, I announced that it was time to take out their mobile phones for photo opportunities. Believe me, when I took my Instagram frame out, it was just a frenzy of clicking. A mother was talking to me while more photos were being taken and hear this: she was posting pictures and hashtagging while we were speaking. She was happily advertising my business to hundreds of people that did not know my business, but thanks to her posting those pictures, they do now. And if those people want to know more about me, they can easily see my logo, Instagram account name, and website in the frame and thus they would know where and how to find me. In my estimation, from those two children’s birthday parties, I must have reached quite a few thousand new possible clients. So there you have it. The Instagram frame may take a bit of work, but is it worth it?